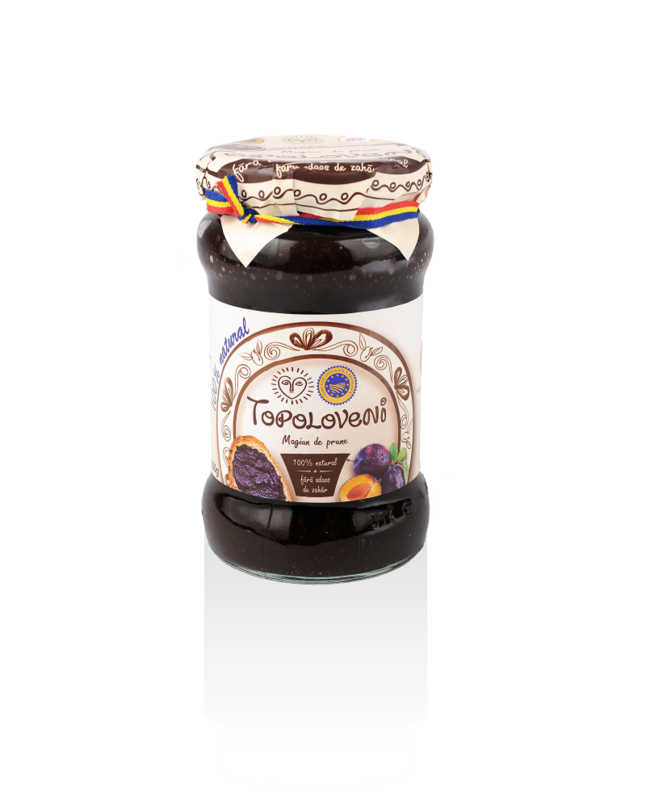 Topoloveni Concentrated Plum Spread, 100% BIO Functional Food. Topoloveni Concentrated Plum Spread can be consumed as breakfast, desert or as filling in the pastry products. The plums are carefully selected, the producer use at least 4 varieties of Romanian plum boiled in special kettles, with double walls, without using direct heat (but technological steam) in order to preserve the healthy qualities of the fresh plums. Composition: ONLY ONE INGREDIENT! 100% fresh plums, harvested on plain ripeness, selected. 100g of finished product is made of 500g fresh fruits, concentration 5:1. Topoloveni Concentrated Plum Spread – 350 g.
Description: This product is a concentrated (5:1), homogeneous, easy to spread, viscous plum paste which can be consumed by people of all ages, starting with 6 months old babies and also by those who suffer from diabetes because of its low glicemic index (39/100g). Content: Topoloveni Concentrated Plum Spread is very rich in macroelements, microelements, macronutrients, micronutrients, phytonutrients, antioxidants -food fibers. Topoloveni Concentrated PlumSpread contains per 100g the following elements: dry matter 56,2%, 1,83 g protein, 0,53 g lipids, 840 mg potassium, 29,31 mg calcium, 22,64 mg magnesium, 6,09 mg iron, 3,56 mg boron, natural sugars such as sorbitol (1,22%), fructose (11,29%), glucose (14,28%). Antioxidant capacity: 275 / 100 g, energy value: 207 kcal / 100g = 876 kj/100g. Glycemic index: 4,5. Nutritional qualities: because of the traditional production process, this product was certified by The National Institute for Food functional food, it has a rich content in food fibers (5,79 %) and natural pectic substances. Awards: This product has two ITQI Superior Taste Award distinctions (2010 and 2011 , from International Taste & Quality Institute Brussels), of the Protected Geographical Indication at European level, of the ”Quality certification” (from National Centre for Comparative Tests), of the recommendation ”Traditional product recommended by BIO ROMANIA” and of the certificate Official Supplier of the Romanian Royal House.